the YouTube link goes directly to the Youtube video "Bigfoot Run In"
Recently Jeffrey Kelley shared his detective work with us regarding a video that was circling the internet titled, "Bigfoot Run In". At Bigfoot Evidence, Shawn's last line about this video seem really telling. Shawn had reported this video on a post titled, "New Footage: Mr. Blurrycam Films Pacific Northwest Sasquatch (Updated). Shaw's last line was, "Update: Flickr account suggests uploader (designperfxion) is really into costumes." It seems Jeffrey Kelley has evidence that supports this. You can watch the video, "Bigfoot Run In" below. BUSTED! Bigfoot Run In Exposed as a HOAX! Some of you may know that I take pride in tracking some of these released Sasquatch videos down to either verify or crack wide open a hoax. I have done it here in The Squatchers Lounge a few times before well here it comes again. Being a computer engineer my talents lean more towards examining video and pictures trying to find the little things that shouldn't be there. In this particular case something never sat right with me concerning this video. Many of the Blogs have covered it and many still think it could be the real deal. Unfortunately it was a stunt pulled by a costume maker in an attempt to get his name out there. The company is called "Klone - Special Effects" While I was out cruising the interwebs looking for content and information I happened upon this web site. 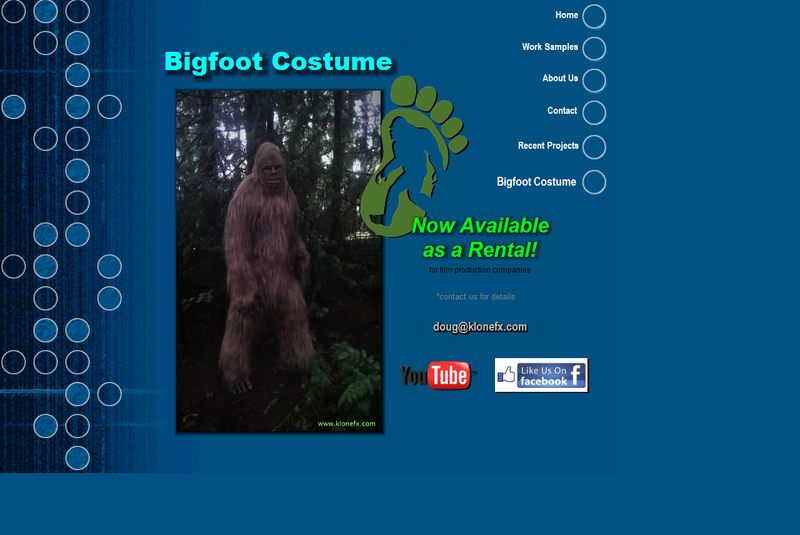 upon looking though the images and links on the page, one of which was labled "Bigfoot Costume" it brought me to the following picture. I claim no ownership of the image and I am posting it for educational purposes only! http://www.youtube.com/watch?v=GHqMD-czRSQClick the link above to view the video or see the first comment to watch in embedded. Many of the blogs had picked up this story when the footage was first posted and still there are questions on the authenticity of the video. After viewing the video several times before my discovery and I had questioned if the video could be real. The comments posted with the video are very misleading as if the encounter was real. "during a hike in the Pacific Northwest I was startled by a noise then saw this step out from behind a tree. I stumbled for my cell phone camera & took this video as it was walking away from me." I am glad to be able to share it with all of you. Oh! I am buying this!!!! Did we really need confirmation that this was a hoax? Excellent work by my boy Jeffrey. Apparently some folks were buying it, so he busted it & posted it. If you already knew, there are plenty of other articles, Facebook pages, and forums that might contain things you don't know. Live & let live. In reference to the Fringe News #63, I just wanted to correct the Reverend about the video, Clear Sasquatch Video From AZ. That video was actually from the Ouachita (WA-SHI-TAW) National Forest in Arkansas. That's in the near Hot Springs. You know 'bout 75-90 miles north of BOGGY CREEK. P.S. I really enjoy your work!